If you already have your own domain, you can bring it to Net Solution through a very simple process. We support all the costs associated with bringing the domain, and we are dealing with the technical part. So, enjoy your domain in a very short, guaranteed time. Why transfer your domain to us? 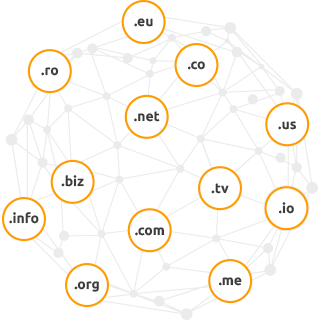 First of all because we have been working on this for over 15 years, giving our customers not only the possibility of transferring a domain but also a lot of other benefits that guarantee the proper functioning and security of the domain on the Internet. Take advantage of the lowest possible prices on a wide range of .biz, .club, .shop domains, etc. There will be no extra costs or fees for any service offered by Net Solution. Every new domain transferred to Net Solution comes along with a number of benefits that provide control and accessibility to your domain, as well as options to help you grow your site and your presence or your business online. Once the payment confirmation is completed, the domain registration is done automatically and you have the exclusive right to use it. You can update your contact information on the WHOIS server directly from your client account control panel. Net Solution gives you the ability to create custom nameservers, such as dns.domeniultau.ro, in a few simple steps. If you use the autorenewal option, you don't need to worry because the validity period of your domain is automatically extended. You can manage your domain's DNS settings yourself using the simple and easy to use administration interface of your account. During working hours, you can contact us on the chat. Besides working hours, we offer non-stop technical support by email or telephone. How do you transfer your domain to us? Get the authorization code (also called the EPP code) from the company that registered your domain. Click the "Transfer domain" button above and fill in the domain name and authorization code. Add to cart and follow the steps to complete the order. Do not hesitate to contact us if you have questions.